This image was not taken by me, I wish it were. I found 8 rolls of film in an antique store already developed inside of 35mm Kodak tins. After scanning the negatives I came to the conclusion that the images were taken in the 1950s based on the car models. The camera belonged to a man who took these photos in his twenties along with his girlfriend. From Canada to Ireland and others in between these photo share a glimpse back in time into this young man's life. 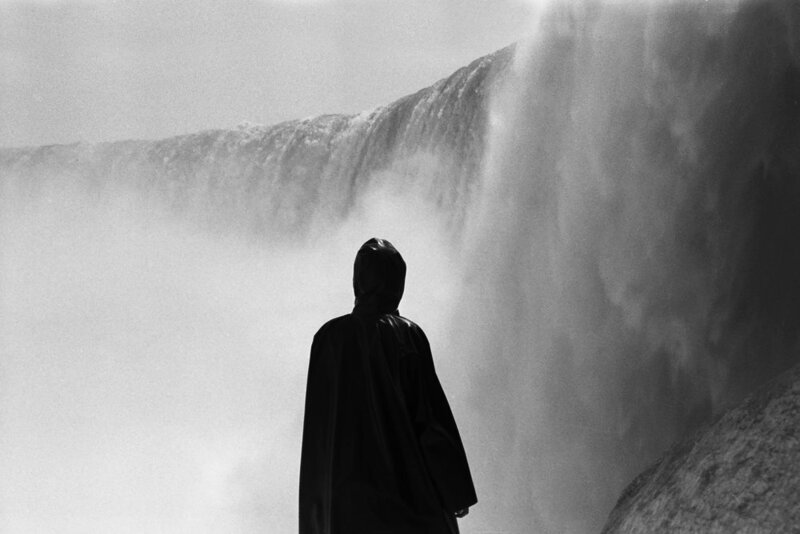 This image in particular was taken on the Canadian side of the Niagara Falls of the man's girlfriend. My interpretation of the cloaked figure is The Reaper. Since I first set eyes on the negative of this image staring up at the lightbulb above my head I felt the power of this image. This image in composed in such a way that gives the subject a surreal energy with the sublime presence of the waterfall. It creates an eerie sense of wonder creating more questions then answers. Inspiration is a funny thing and can strike you at any moment. This image has inspired me to seek out images of cloaked figures. Not only that but it has made me more aware of imagery and representation that passes us by everyday. Oddly enough it has inspired me to do more of what I want with my life. The figure can be viewed as a representation of the fine line between life and death. This image is a reminder of the imminent death every living creature faces. One day we will die, this does not have to be a sorrow, but rather we can use this to fuel us. Life has a deadline and you cannot do everything the night before. It is important to have reminders so that we can do the things we want to do ahead of time, while we still can. This image is of someone living, someone living their dream and making it a reality. Doing the things they love with the people they love. This is a reminder that nothing is permanent, I have no idea where these people are or if they are still here today. But what I do know is the energy is very still much alive and has affected me. Now isn't that magic? To be able to time travel to a single fraction in time and have something almost 70 years old possess something so illusive. First looking through the scans I was transported to another time, another world. The style of characters were different, the architecture, the vehicles. But then I began to realize I was looking into a mirror. I felt a compassion for the individuals in the images but also related to the person behind the camera. I would capture the same things that this man would capture. In a brave new world 60+ years later, from these images I have come to realize that not much has changed. The human spirit is still very much the same and life really hasn't changed that much. Through the images these individuals share a life full of joy and happiness with their friends and family. Taking pleasures in the simple things like fishing, walking, exploring, travelling, and visiting museums. I can relate to these images while I try and piece together what was going on, what conversations were had, what significance these moment played in their lives. I feel as if this man could be me in another life. The man and woman involved in this image had no idea at the time the effect it could possibly have on someone. My intentions are always just and I respect the personal aspect of these images. However, I believe the purpose of art is to not only inspire, but also document and express what it is to be alive. What it means to each individual to live, to feel, to love. To create more questions then answers, but ultimately show that just for a moment in the grand wrinkle of time we existed here on this earth, and we had the best possible time we could.